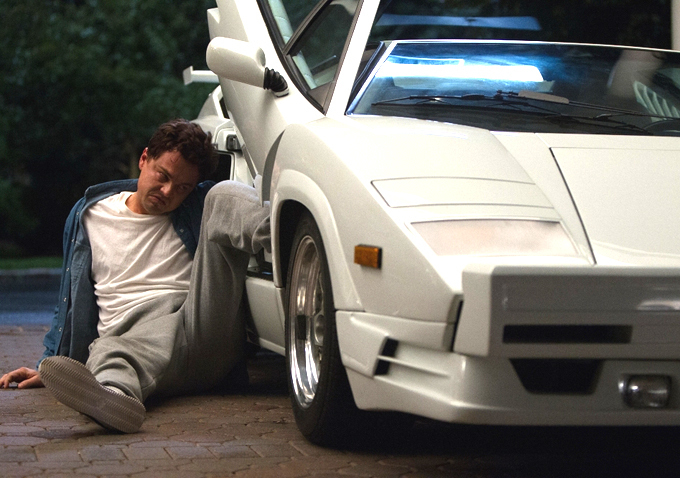 All you need to see of The Wolf of Wall Street are the first twenty minutes. In the second sequence, we meet Mark Hanna, “the guru”: champion Wall Street warrior, shaman of stock sales, cool cat, high roller, alcoholic, coke addict, masturbation junkie. Played by the reigning cowboy of American cinema, Matthew McConaughey, Hanna takes our green recruit, Jordan Belfort (Leo), for lunch and proceeds to teach him the tricks of the trading floor: get off, get laid, get plastered, get high, get pumped, and don’t take no for an answer. As he delivers the monologue containing such wise counsel, Hanna orders the waitress to bring him two dry martinis every seven minutes until further notice, takes a bit of “snuff”, and then shares his insight into human psychology. McConaughey’s brief performance is noteworthy; he carries off the character’s eccentricity with perfect ease and just enough charm. Now, imagine his character multiplied by one hundred, and his chest thumping, powder snorting, cocktail binging extended over three hours and twenty minutes. Jordan’s bachelor party, onboard a private jet. A still from the famous quaalude sequence. The first problem with Scorsese’s film is that it’s a biopic, and the biopic rarely sees its characters as historical agents, suspending them instead among the finer particles of legend—far from time, place, and circumstance. In The Wolf, we never encounter the men and women Jordan cheats or the Lower Manhattanites he claims for rivals. The only glimpse of reality, of the world beyond his home and offices, is a brief, random shot on a New York subway at the end of the film. Suffice to say that this genre does not lend itself to critical conceit or a nuanced examination of character. To understand Jordan Belfort’s weaknesses and his relationship to a world he ignored, perhaps we need to ask a more essential question. For all the filmmakers, writers and students of human nature out there—what is that appeals to us in representations of the human experience? Courage, fear, honor, disgrace? Friendship, love, compassion, joy, fun? Excellence? Stupidity? At the moment, we have a national passion for buffoonery, but Jordan and his friends are not stupid. I have a hunch that what we find striking in him are his audacity, incorrigibility, and doggedness. Are such qualities really so impressive? Boldness alone does not a courageous man make…and incorrigibility and doggedness are something else altogether. For the sake of good argument then, let us consider courage in some detail. As it happens, I am reading Joseph Conrad’s novel Lord Jim, a profound inquiry into strength and weakness in the human experience. In this tale, the narrator, Captain Marlowe, takes an interest in the fate of a young man, Jim, who loses his honor when a crisis overwhelms him. As he relates Jim’s fall and rise, Marlowe introduces us to several courageous men. There are an aging French lieutenant who rescues a badly compromised ship; Stein, a wealthy Austrian merchant, former revolutionary and all-around hero of adventure in the south pacific; and Doramin, a tribal leader in the pirate colony of Patusan. The way in which Conrad presents these minor characters and their exceptional qualities is worthy of further consideration. The French naval officer sips cassis à l’eau while leaning against the wall of a café. In conversation, the man’s “ponderous immobility” is “profoundly responsive,” and somehow filled with wisdom and expression; likewise he utters slang phrases with “imperturbable seriousness.” Conrad sees him as a vestige of time and a testament to a life lived quietly but well: “the iron-grey hair, the heavy fatigue of the tanned face, two scars, a pair of tarnished shoulder-straps; one of those steady, reliable men who are the raw material of great reputations, one of those uncounted lives that are buried without drums and trumpets under the foundations of monumental successes”(111). Clearly Terence Winter and Jordan Belfort, with their pretense and ostentation, their shouting and flailing, inhabit another universe. As for Conrad’s Stein, “His life had begun in sacrifice, in enthusiasm for generous ideas; he had travelled very far, on various ways, on strange paths, and whatever he followed it had been without faltering, and therefore without shame and without regret”(164). Yet, despite the accumulation of exciting happenings and illustrious companions, Stein prefers his butterflies, consuming the daylight and many candles besides to study and correspond with other naturalists. He is thin and tall with a serene and thoughtful countenance. While escorting the narrator to his guest quarters, “He walked slowly a pace in advance with stooping courtesy; there was a profound, as it were a listening, quietude on his face; the long flaxen locks mixed with white threads were scattered thinly upon his slightly bowed neck”(165). During an attack on his enemy, the chieftain Doramin has himself carried up the hill in an armchair. “There he sat, moving neither hand nor foot, a flame of dry brushwood behind him, and lots of people rushing about, shouting and pulling round him—the most solemn imposing old chap you can imagine” (202). Doramin’s immense girth and silent gravitas constitute the pillar on which rests the fate of his village. Without him civilization would collapse and the surrounding world fall into chaos. Likewise, Conrad suggests that were it not for men like the white-haired Stein and the weary lieutenant, the same would be true in the larger context as well. Conrad envisions courage as immovability, imperturbability; these men are all stillness and reticence. They listen and ponder, acting upon necessity (as opposed to whim). Fear, loss, and risk are their intimate companions—not enemy phantoms to be avoided, conquered, or purged. As a result, each of these characters is mysterious, and his economical speech both reveals and conceals a story that has not been fully told or not told at all. Meanwhile the man whom fear grips is hysterical; ignoble actions are the result of panic and frenzy, and tyrants are wild, mad, opium addicts. In contrast to the three noted above, the villains in Lord Jim are not mysterious at all. Their faults and weaknesses are obvious, their actions and reactions, predictable, and as a result, any extended treatment of their victories and mishaps would be monotonous and repetitive. Jonah Hill in a scene inspired by Fellini. Jordan Belfort cannot be called courageous if he is always high, nor can he be considered imperturbable, since once again, he is always intoxicated. Instead Jordan behaves much like a tyrant, ignorant of courage and honor, cheating and swindling his customers, clients, and competitors. Nonetheless, the film exalts him; it asks us to identify with him through point of view and dramatic ploys. The voice-over and epilogue may aspire to critical commentary, but there is far too much sentimentality in the film for successful satire. Self-conscious shots and sequences are tacked clumsily onto the end. Likewise, it is too boring and poorly organized to be a farce. The melodramatic elements are superficial; Jordan’s authentic experiences and feelings (love, joy, fear) mingle precariously and indecipherably with the effects of chemical substance abuse and various other addictions. In fact, once he goes clean, he seems immune to feeling, fun, and principle alike. Moreover, there is nothing dynamic in Jordan’s characterization, no conflicts, ambiguity, or redeeming qualities to speak of. Even his beloved firm, Stratton Oakmont, his best friends, his wife and daughters, the people whose fortunes he made, have no claim on him. He easily betrays them all. Even sober, he remains as insensitive to the world as ever. By contrast, Conrad shows that success, ownership, esteem, and admiration possess a man, making him as responsible to his creation and subjects as they are to him. A rehabilitated Jim “looked with an owner’s eye at the peace of the evening, at the river, at the houses, at the everlasting life of the forests, at the life of old mankind, at the secrets of the land, at the pride of his own heart; but it was they that possessed him and made him their own to the innermost thought, to the slightest stir of blood, to his last breath”(190). My point is the following: If we are going to make this kind of creative and financial investment in a movie (and viewers have a stake too), why not consider more enigmatic characterizations, more complex treatments, and more interesting genre? Of course I also wish that we reevaluate those qualities which make a man like Jordan so successful. 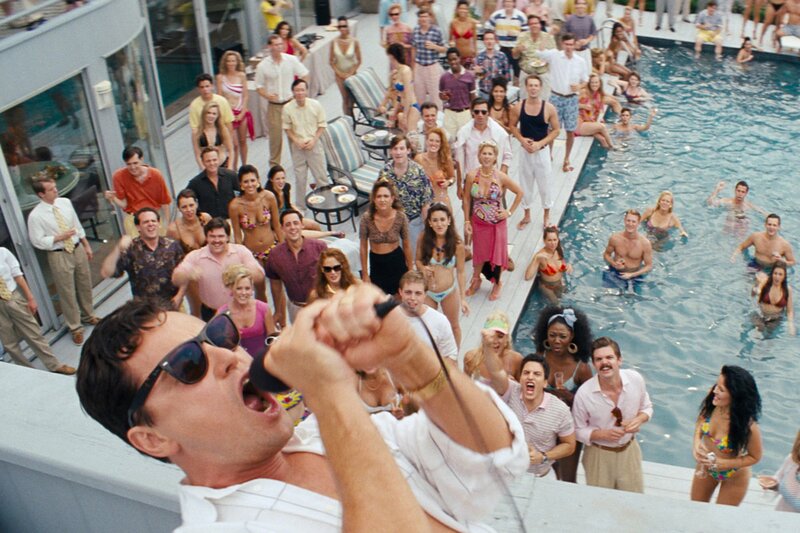 The Wolf of Wall Street is an extravagant film. There are films that exist as homage to the medium, that stand as a testament to the filmmakers’ love for moviemaking. Although the best such films also have moral depth, artistry, or humor. Or, at the very least, a remarkable mise-en-scène! Excepting a few sequences—the underwear-clad marching band among them, The Wolf also lacks this. If you appreciate a movie about loving the craft, there are much better examples in Scorcese’s own oeuvre, voir Gangs of New York (2002), or in the work of Federico Fellini, the original extravagant filmmaker and much admired by Scorsese. If bacchanal strikes your fancy, try Fellini’s Satyricon (1969), based on a satire by the first century Roman author Petronius. For a more soulful example, that exposes the emptiness in ill-gotten gains and senseless revelry while also treating the eye to a lavish mise-en-scène, you might look to The Dolce Vita (1959). In conclusion, the first question posed above—why make this film—is impossible to answer. One might look upon the best The Wolf has to offer as one of those videos you make with your buddies on a golf trip. You laugh at it together over breakfast, and then quickly erase it before wives, employers, or officers of the law catch a glimpse. It appears that the director and actors, at least, amused themselves greatly—which I applaud, however, I don’t see why I should have spent $12.50 to see their inside jokes—never mind why the American film establishment should distinguish their efforts with honors or awards. Suggested viewing: For a contemporary example of the farce, consider The Hangover (2009); for a classic example, It’s a Mad, Mad, Mad World (1963). A Town Called Panic [Panique au village, 2009] is one of my favorite animated farces, and Margerithe von Trotta’s Vision (2009)—about Hildegard von Bingen—is one of the more interesting biopics I’ve seen. Quiz Show (1994) is an engaging drama that successfully integrates a critique of the media industry and American consumers while Winter’s Bone (2010) is a beautiful film about courage that features a female lead. En revanche, if you want to see how ugly doggedness can be—once you take away the Lamborghini, the mansion, and the designer suits, see Lina Wertmüller’s Seven Beauties [Pasqualino Settebellezze, 1977]. If naked marching bands, outrageous sets, and large casts appeal to you, see any of Federico Fellini’s films made after 1959, but especially La dolce vita (1959), 8 1/2 (1963) and Amarcord (1973). If you want to know what a satire is, you should see Fellini’s short film, The Temptation of Dr. Antonio [Le tentazioni del dottor Antonio, in the collection Boccaccio 70, 1962] or read Voltaire’s Candide (1759). This entry was posted on February 5, 2014 at 6:04 am and is filed under FILM REVIEWS. You can follow any responses to this entry through the RSS 2.0 feed. You can leave a response, or trackback from your own site.